I was intrigued about standing desks ever since I read about them. Will it make me more productive at work? Will it burn more calories(and help me lose weight)? One month ago, I decided to build myself a standing desk. Build is an overstatement. My total cost outlay is exactly zero. The standing desk height is the key factor in the construction. It has to be high enough that my elbow can rest comfortably on the desk. I found 4 bricks outside my house and used them as a stand. I wasn’t sure if the desk would be high enough. Luckily it was. Another slice of luck came my way. 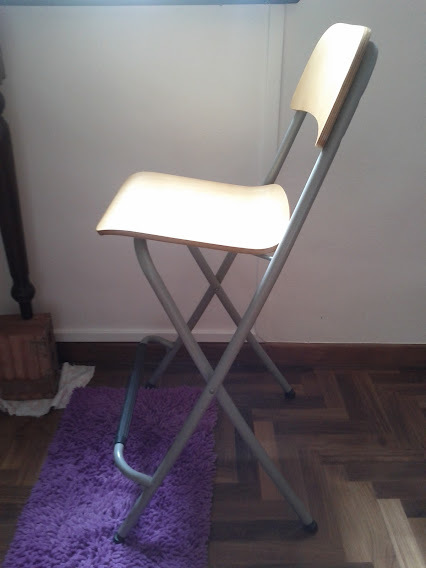 I found an unused bar chair in my house. Was it high enough? It was. 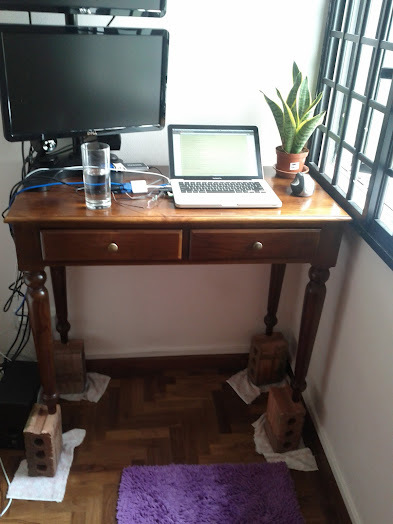 So here is my improvised standing desk. Built in half an hour. Cost exactly nothing. I can stand or sit whenever I want to. I spend an average of 8-9 hours standing every day. That is interspersed with breaks. My overall fitness is good. I usually jog a few times every week. I’m not overweight. It took me a week for my body to grow used to standing for long periods. Does your whole body feel stiff after sitting down for the whole day? I do. The first thing I noticed is the stiffness is gone. My back never felt better. Standing allows the back to be in its natural position. There is no stiffness through the day. It just ceases to be noticed. Given I do not have a history of back problems. I’m sure standing would have prevented future back problems. My feet bore the brunt of my weight. Over long periods of standing, I find that the hindfoot gets sore. The muscles on the calf and those on the back of the thigh feels tight. The tense sensation extends from the back of the thigh all the way to the hind foot. It is not that bad. You will notice the tightness when you walk after standing for a while. Stretching might help. My feet do not remain in the same position. They vary between resting on 1 foot or both. I tend to walk around more, simply because there is less friction. When you are seated, it requires effort to get up. When you’re already standing, there is no effort overhead. Getting a floor mat helps to reduce fatigue. There are a plenty of fatigue mats for sale. I found an unused mat in my house. It helps to reduce the soreness of the hindfoot significantly. I believe any soft surface would suffice. Decide for yourself if you need to buy one. My suggestion is to try a cheap one first. I noticed I tend to edge closer to the desk when I stand. That is bad for the eyes as it is too close to the computer screen. When you’re sitting down, there is a gap between you and the desk. To prevent that, I try to place my floor mat further away from the desk. How does standing desks make you more productive? Mentally, I feel more alert and clear when I’m standing. Physically, I don’t have to adjust my sitting positions every now and then. Sitting tends to encourage bad postures. Slouching backwards. Hunching forwards. It is easier to get into a comfortable position while you’re standing. There are only 3 positions. On both feet, or on either foot. As a result I don’t find myself getting bothered by my body when I’m working. Another much touted benefit is weight loss. It didn’t happen to me. My weight remained the same after a month. I’m supposed to be burning more calories as I stand. Perhaps I ate more during this period. I suppose it differs from person to person. I’m happy enough with standing desks that I’m going to continue using it. One suggestion. When you’re starting out, there is a temptation to sit down. Take the chair away. It does reduce the temptation. Hope your standing desk experiment works out!